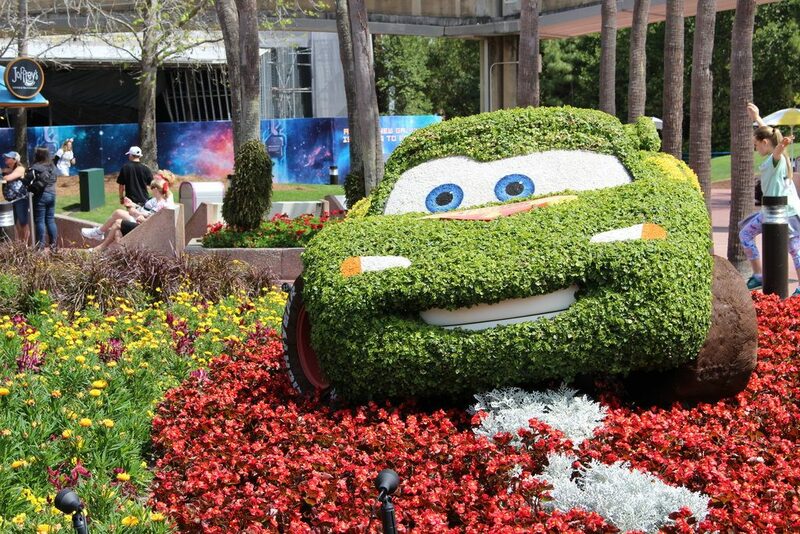 Topiary—the training of living trees and shrubs into artificial, decorative shapes. 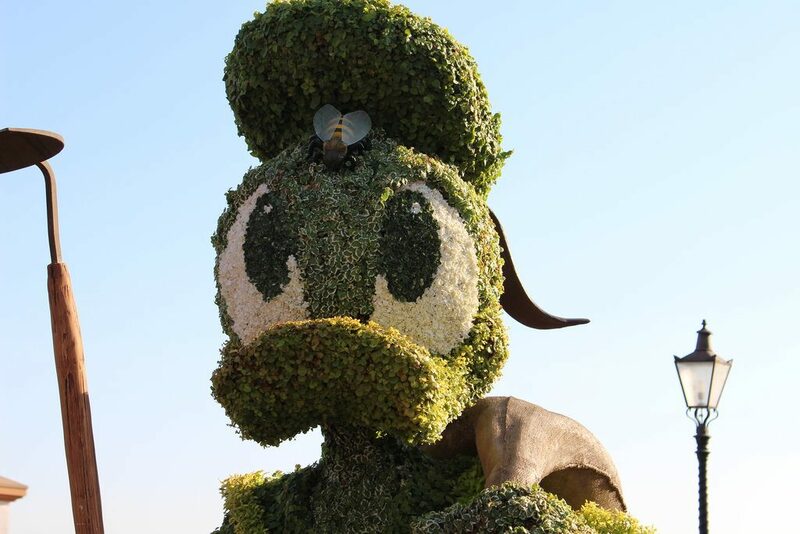 The Disney Company didn’t invent the art (a friend of Caesar Augustus did that), but Disney has certainly kept the practice alive for new generations to enjoy. 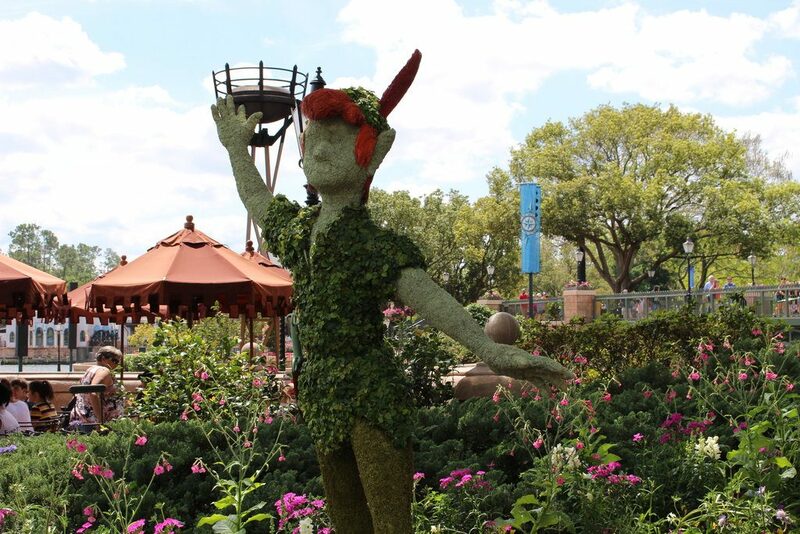 Walt Disney was fascinated by horticulture and the innovation he expected from his horticulture team was no different than the cutting-edge thinking he expected from his animators and theme park Imagineers. 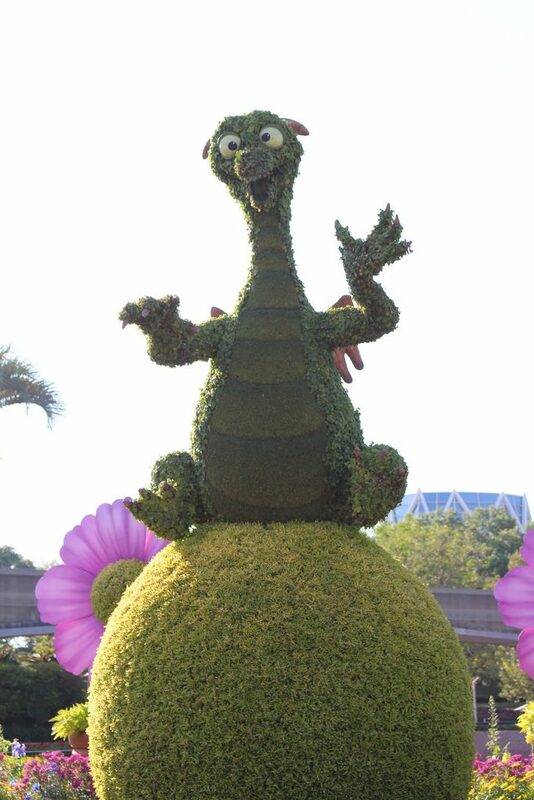 Plants serve numerous purposes at Walt Disney World. 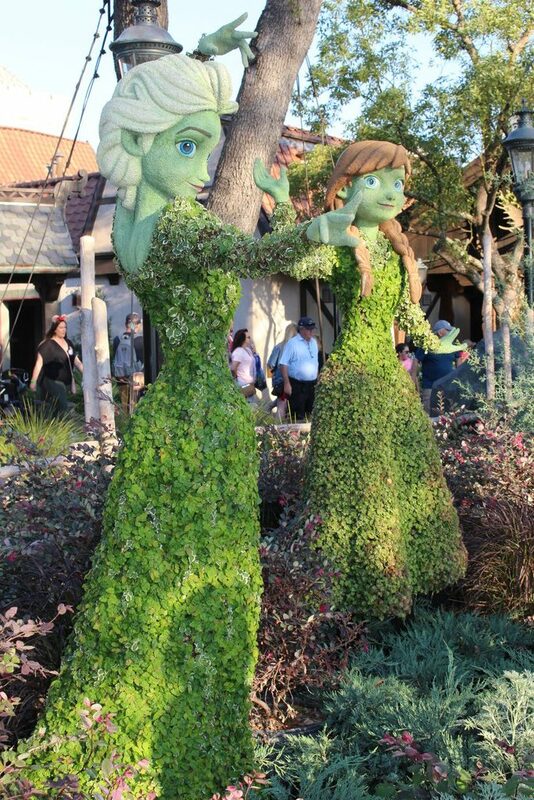 They set the scene, they education, they camouflage, and in the case of the character topiaries—they entertain. 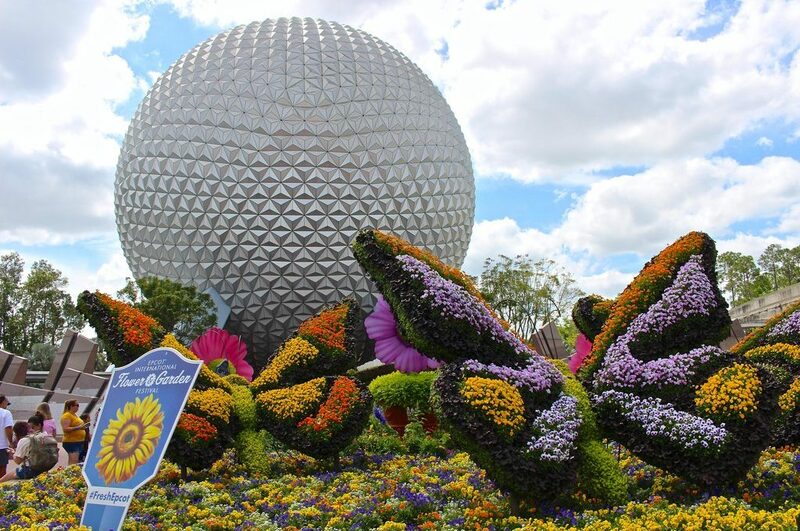 The highlight of the annual Epcot International Flower & Garden Festival is definitely the topiaries. 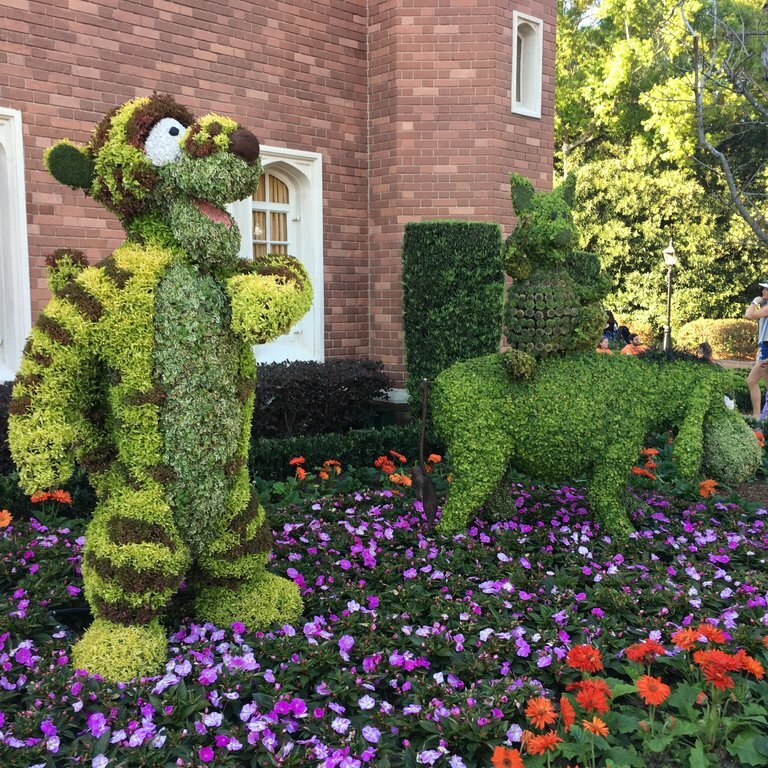 This year, more than 100 topiary displays are featured in the park, many in the shape of favorite film characters. 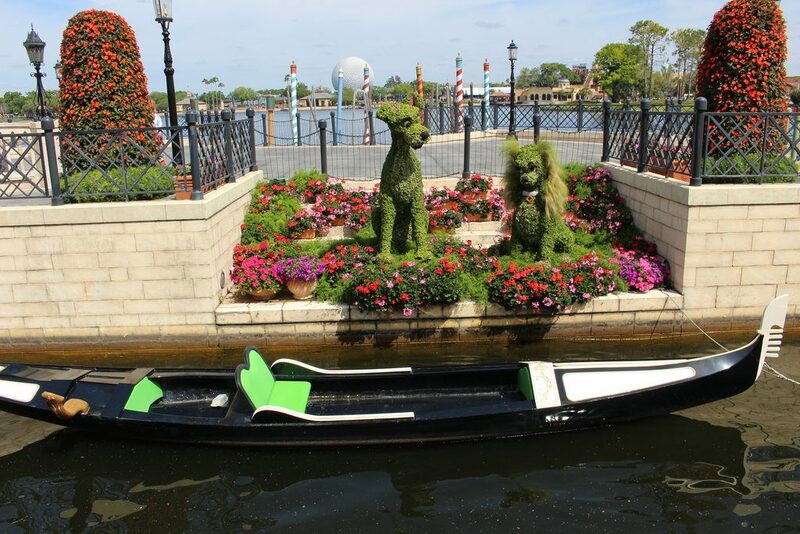 Words can’t describe how eye-catching these topiaries are—so we’ll show you in pictures. 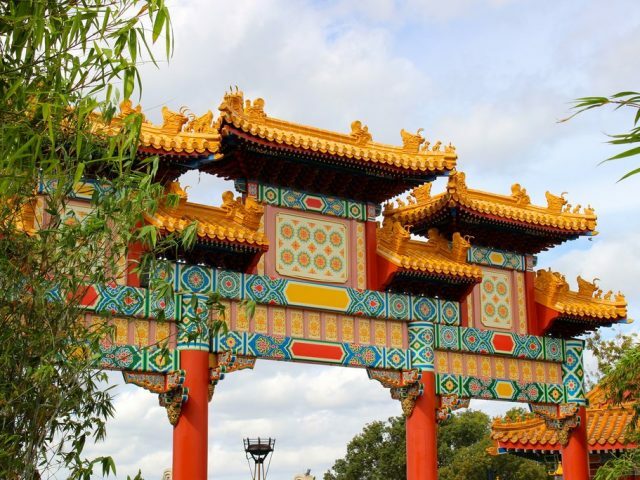 On the day of our visit the cloudless sky and bright Florida sun played some tricks on our camera, but here is the best of our photo collection. 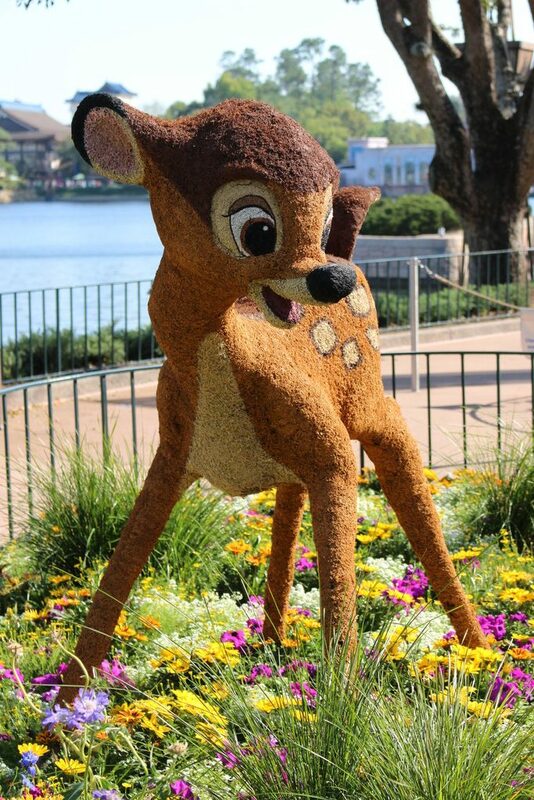 Bambi and friends stand between the UK and Canada. 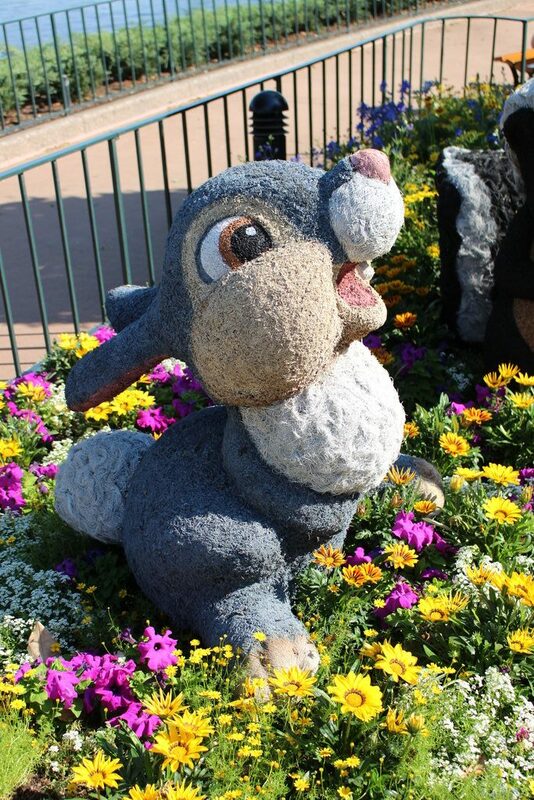 Thumper is one of the few topiaries created in his character colors. 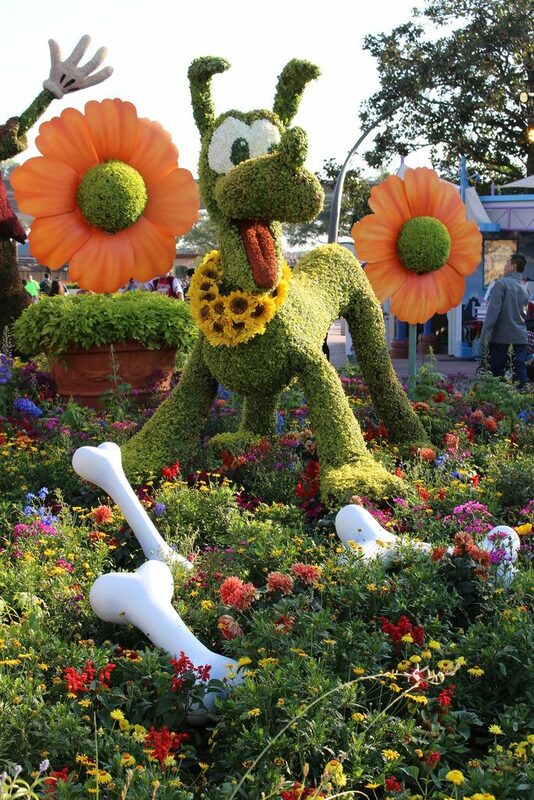 Flower looks worthy of a Rose Bowl parade float. Pluto stands front and center with the rest of the Fab 5. 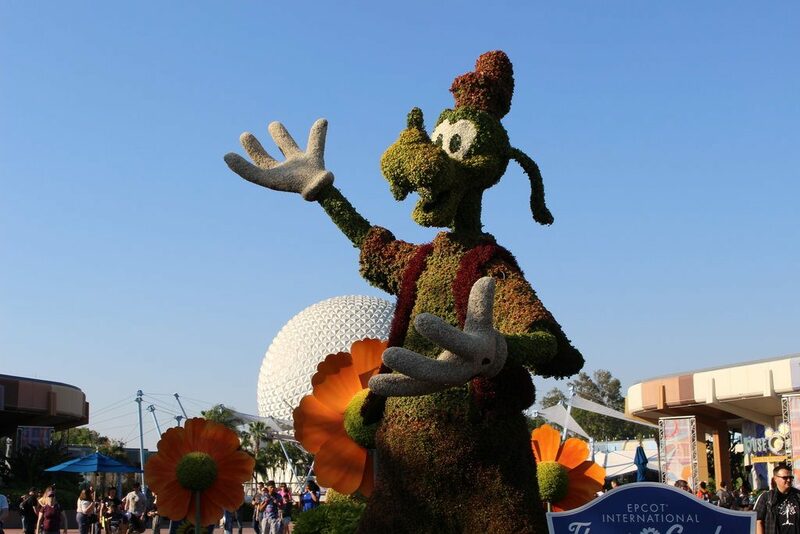 Goofy waves hello to the crowd. 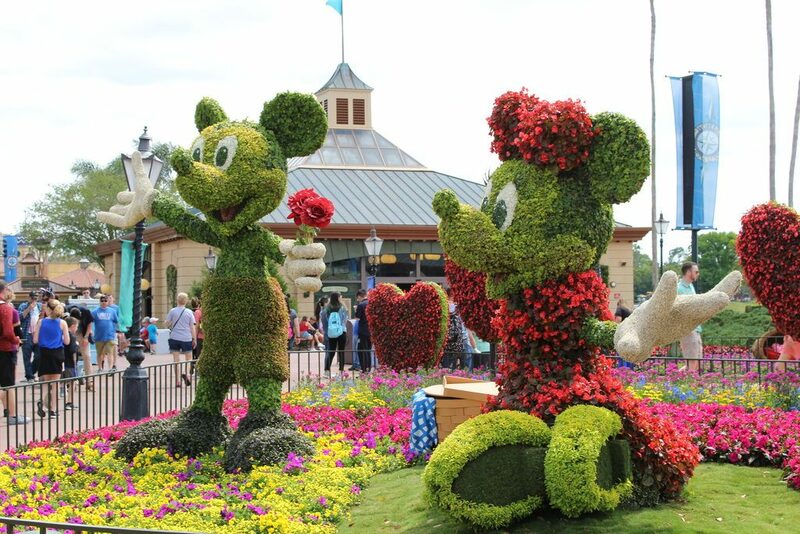 Sweethearts, Mickey & Minnie, are the most popular photo stop. Donald’s preoccupied with a stinging problem. 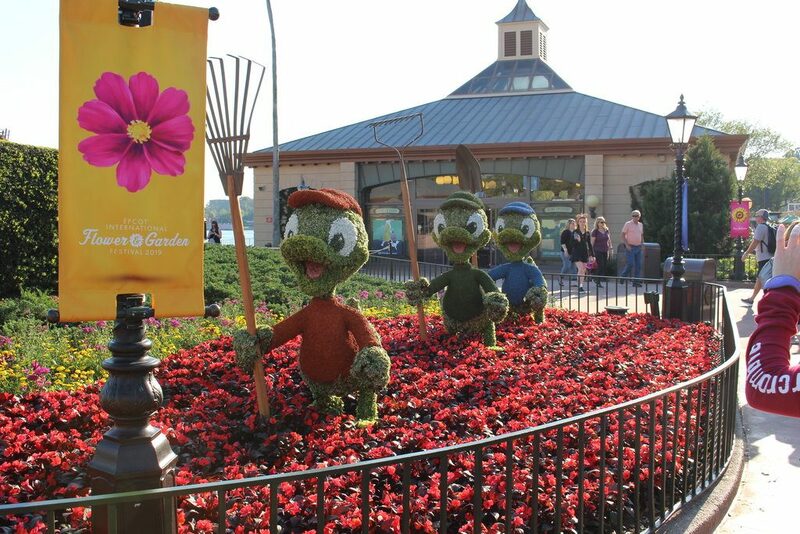 Huey, Dewey and Louie are ready to help. 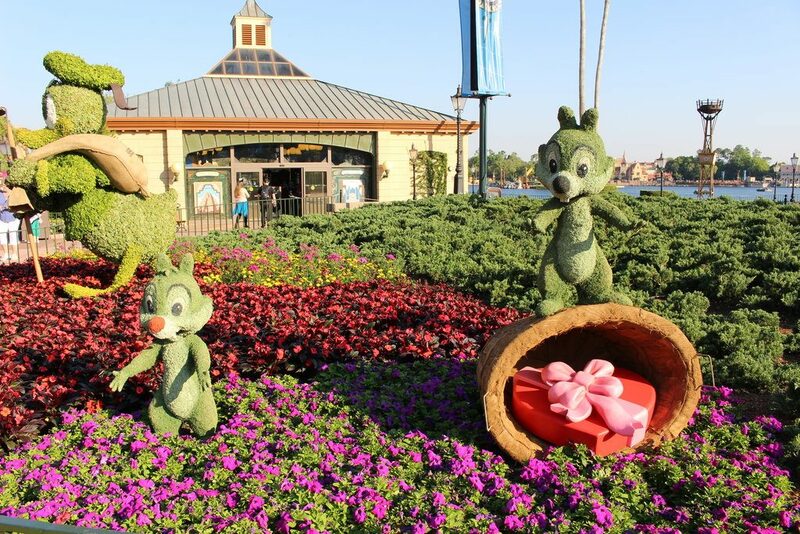 How do you tell Chip and Dale apart? Chip has the darker nose, like a chocolate chip. 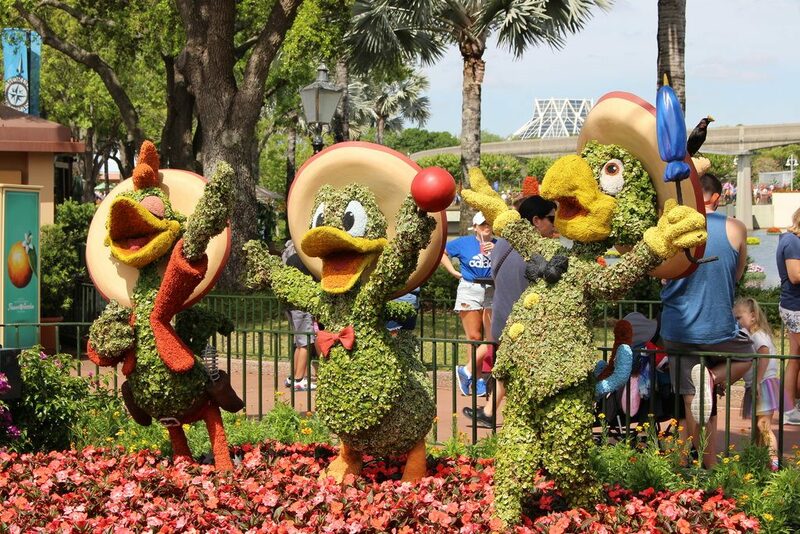 Donald appears again with his caballeros. Winter is coming to Norway. 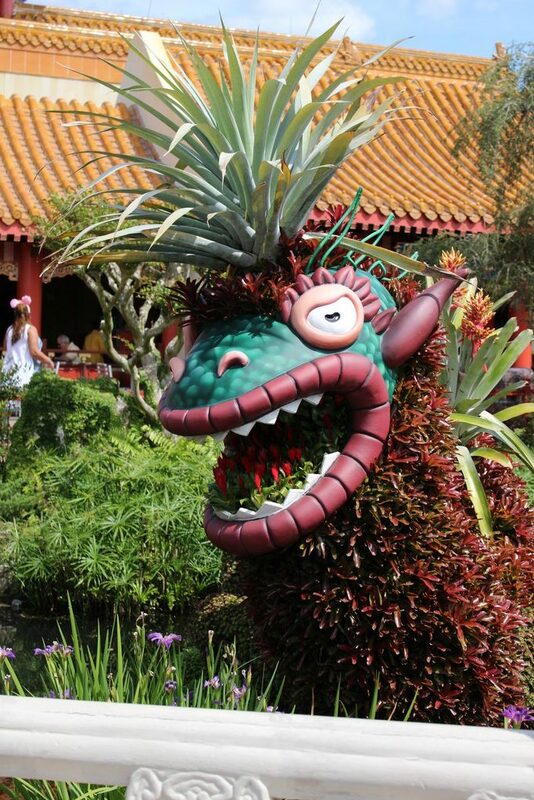 In Japan, the dragon rises from the lily pond. The most romantic duo? Lady and the Tramp in Italy. 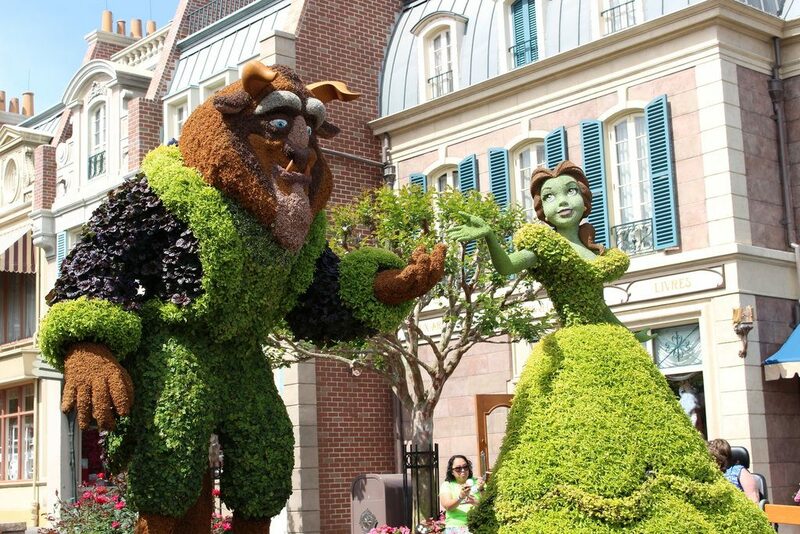 What would France be without the Beast and Belle? 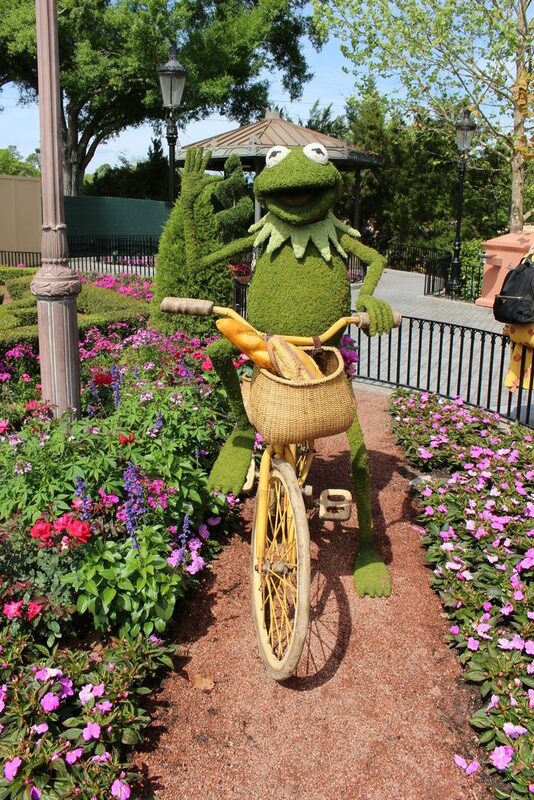 Everyone’s favorite frog is also everyone’s favorite topiary. 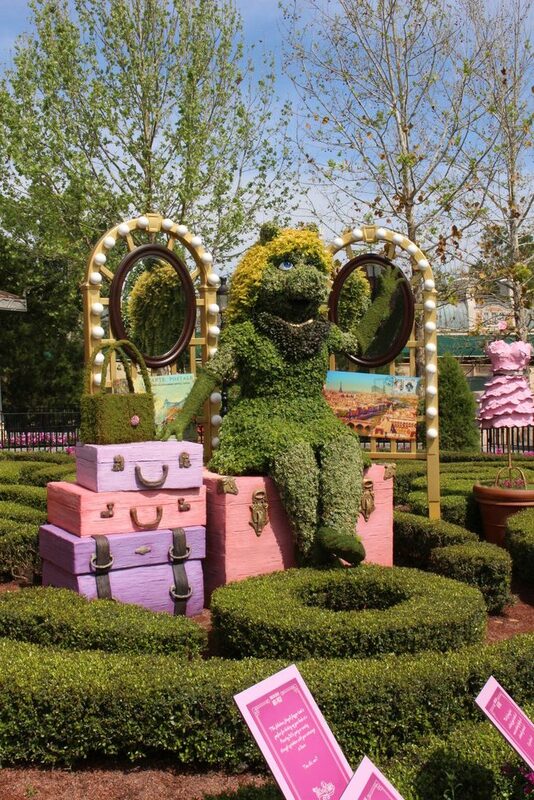 Miss Piggy awaits her cue. 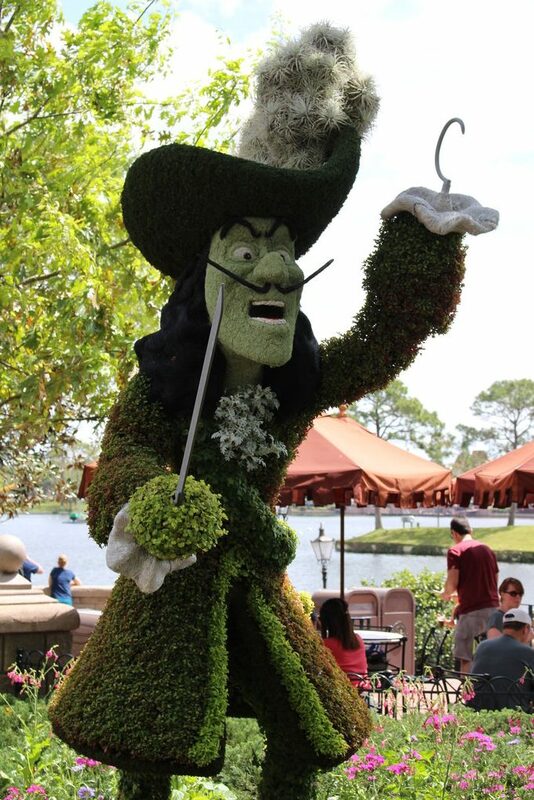 Captain Hook waits impatiently for Fish ‘n Chips in the U.K. pavilion. 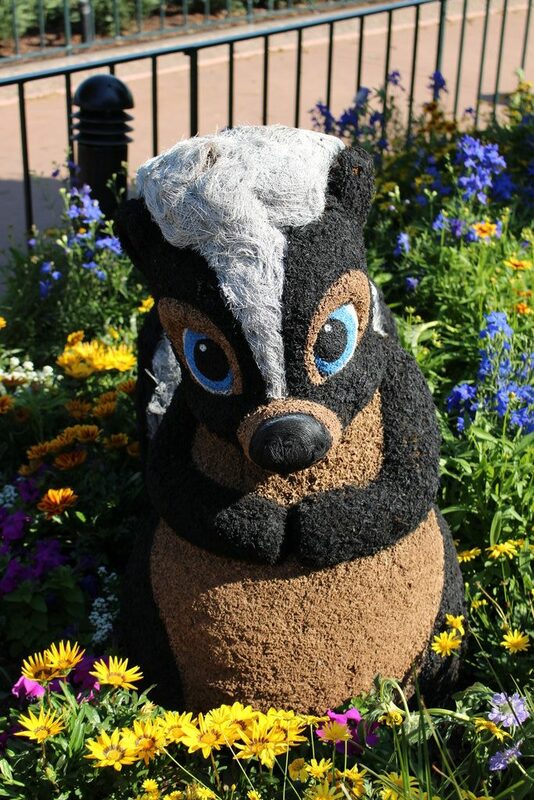 Um, Imagineers. You forgot something. Peter’s eyes? At home in the U.K are Tigger, Piglet and Eeyore. 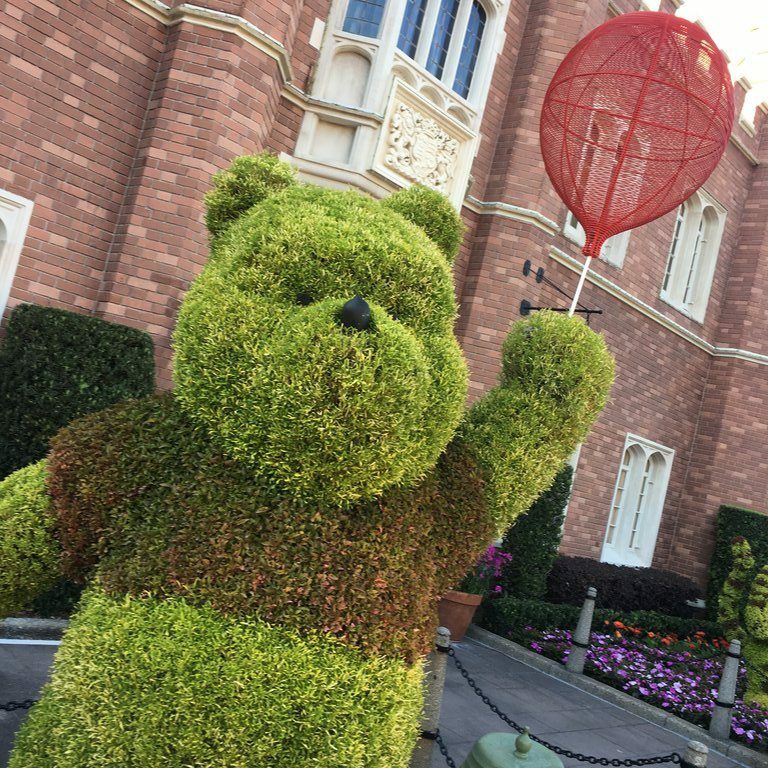 Shouldn’t Pooh’s balloon have Mickey Ears? 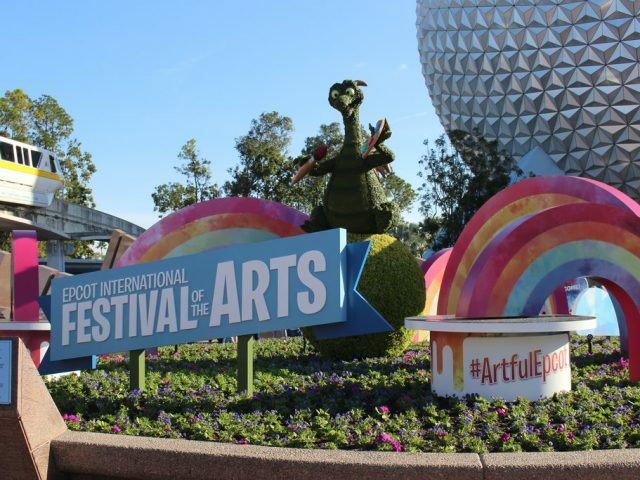 Figment stands near his signature attraction. 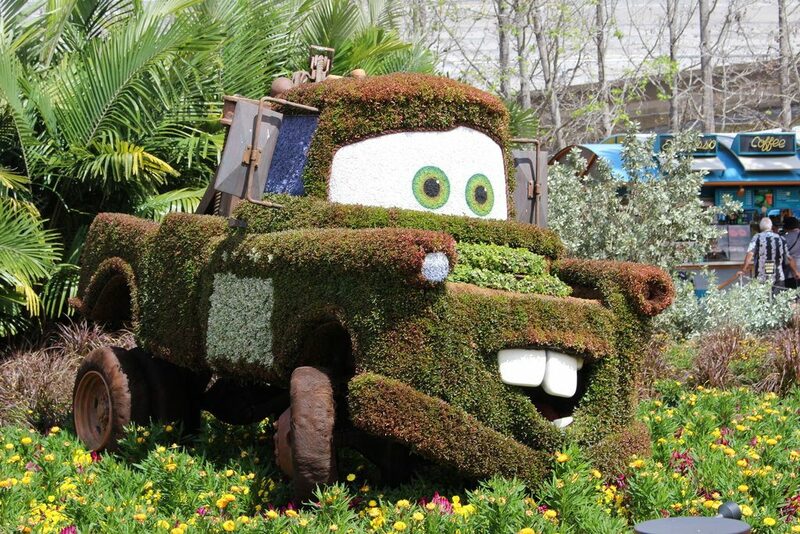 Mater and Lightening McQueen pose near what else? Test Track! Hey, shouldn’t you be at the new Hollywood Studios attraction? 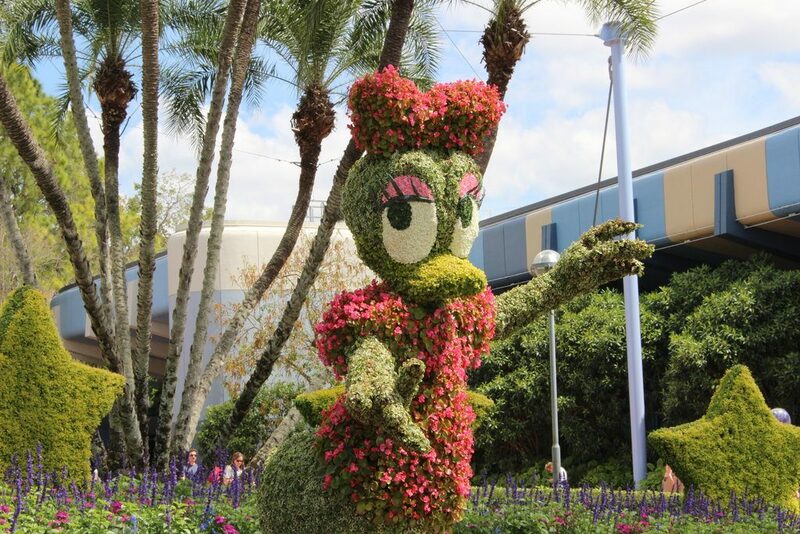 Daisy, a star on her own, poses near Spaceship Earth.